Tressette or Tresette is one of Italy's major national trick-taking card games, together with Scopa and Briscola. It is recorded only from the early 18th century, though greater antiquity is suggested by its trumplessness. The name of the game, literally "three Sevens" may refer to a scoring combination no longer recognized, or to the fact that it is played up to twenty-one. There are many variants depending on the region of Italy the game is played in. Also called Tresette con l'accuso, it is one variation scored up to 31 is to use bonusses during game play. When you gather three Aces, three Twos, three Threes or any Napolitana (A same suit grouping of an Ace, Three and Two) and decide to play one of the group of cards, you declare that you have that grouping in your hand and score three points. A group of four (four threes, twos, aces) also scores three points. As well, the bonus may be repeated if having played one of the grouping, you happen to pick up a card that makes the grouping in your hand yet again. To keep track of all this, players traditionally turn one card in their collected cards face up, as it is done in scopa. Ciapanò (meaning "don't collect", or more literally "take not", in several northern Italian dialects), or Traversone (as it is usually called in Central Italy), is a variation where the goal is to score the least points. The game ends when a player has 21 or more points, and the player with the least points wins. It is possible to do "cappotto", i.e. collecting all the 11 points, in which case the player scores 0 points and everybody else scores 11. Ciapanò can be played by more than two players: if the players are 4 or 5 each one plays on his own, and they receive 10 or 8 cards respectively. If the players are 2, the normal rules apply. If the players are 3, two players receive 13 cards and the one at the right of the dealer is dealt one more card. Before starting to play, he chooses one of his cards and passes it to the player at his right, who takes it and then passes one of his cards to the last player. The last player puts then one of his cards aside, to be taken by the player who wins the last trick. One of the regional variants to Ciapanò involves a special score for one of the cards (usually the ace of clubs) of eleven points, that is more than all the other scoring cards combined. The game ends when a player reaches 101 points, and the other rules are unchanged. Trešeta is a variant very popular on Croatian Adriatic coast, particularly in Dalmatia. 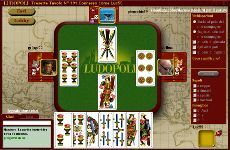 It is played using the standard Italian 40-card deck. It can be played one on one but most commonly it is played by two pairs of players where partners are seated opposite of each other. The main difference from the Italian version is that it is usually played until a player or two partnered players reach 41 points, opposed to the 21 points usually required in Tressette. Also, the player that scores the last trick is rewarded with a full point and not ⅓ of a point. Otherwise, point value of card are identical to Italian version. The cards that score ⅓ point (Kings, Horses, Knights, Threes and Twos) are most commonly referred to as belas. Having three belas or three aces or three highest ranked cards (Ace, Two, Three) of the same suit in hand is known as akuža. Akuža can only be won in a four-player game. When player gets an akuža, three points are immediately added to their total score. However, akuža must be announced before the player has played their first card. Play Tresette online and other games for free. Enter Ludopoli the games city and find new friends!